Sure, there are plenty of quick-fix approaches to clearing some closet space. You could double up your dresses on one hanger, roll your jeans rather than fold them, and, if you’re really desperate, you could pull a Carrie Bradshaw and stuff sweaters in your oven. Unfortunately, none of these tricks qualify as honest-to-goodness spring cleaning. And, when the season changes, you know you’ll want to hit your favorite stores to stock up on the latest trends. We don’t blame you. In fact, we’re right there with you — that’s why we’ve committed to making lots of room in our wardrobes. Listen, we know the goodbye process isn’t easy. So, we came up with an idea to make ditching those duds a little more enjoyable. 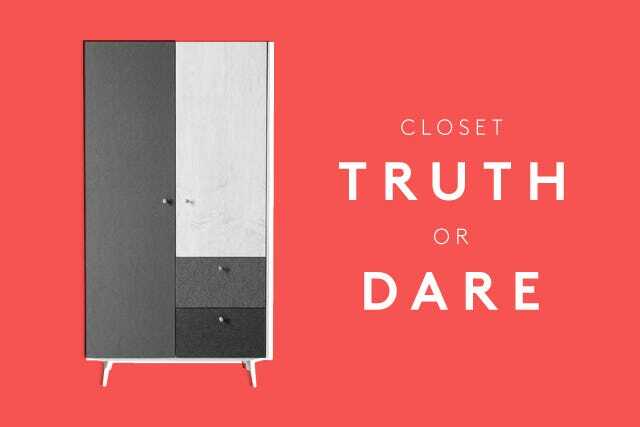 Whether you’re a self-diagnosed hoarder, a firm believer in the trend cycle (you know, that whole '90s comeback), or you just really love your shoes, we’ve got a feeling you’ll want to play truth or dare with your closet. It’s a feel-good method of minimizing that’ll leave you genuinely satisfied. Once you start playing this game, we promise you’ll have a better handle on how to avoid impulse buys. You’ll learn which pieces you actually need, and you’ll be able to make old clothes seem new again. Follow the guidelines below, and you’ll feel so content, you may even want to treat yourself to a shopping trip — um, we mean fro-yo. Before you go to bed at night, ask your roommate, significant other, best friend — anyone who’s at your place, really — to select one piece from your closet. If you live alone (lucky you! ), close your eyes and land your finger on a single item. This includes shoes, tees, scarves, belts, and tanks as well as sweaters, dresses, jumpsuits, and your more standout, go-to numbers. If your wardrobe is split up and your entire sum of clothes is not located in the same space, switch up the spot you choose from each night. The key here is to try to make sure you have absolutely no say in what gets picked. You want to be completely surprised — and maybe even thrown off. In fact, this exercise is more useful when your better half pulls out an old shrug you haven’t seen in years and you immediately think, Is that even mine?! Once you’re confronted with your item, take a deep breath, and ask yourself: Truth or dare? If you don’t think you can construct a look around the garment in your hand, be honest about it. The “truth” aspect of this game is, in fact, most important. While you probably loved all of your clothes at the time they were purchased, there’s an inevitable point of retirement for most of them. Perhaps your style has evolved. Maybe your body has changed and you’re a different size (which is totally okay). Or, it’s quite possible you’ve outworn some of your items. Examine the piece that’s been pulled. Does it look wearable, or is it wrinkly and faded with a ragged hem? If you can’t imagine sporting a look that includes it — and layering turtlenecks and chunky sweaters over whatever it is doesn’t count — it’s time to move on. But, that doesn’t necessarily mean you’ve got to throw your frock in the garbage. Be mindful about where your clothes are going to end up. There are plenty of places where you can donate your threads to those in need, and there are just as many secondhand shops if you prefer to go that route. It’s important that you maintain an ethical sensibility and recognize that just because you’re through with an item, that doesn’t mean someone else can’t make use of it. Actually, you should feel happy knowing that another girl (or guy!) will love your clothing just as much as you did when you first brought it home. Now, if your roomie happens to pluck one of your all-time-favorite dresses from your armoire, then you will wear it tomorrow morning. Challenge yourself to style it with something new or unexpected. Invite heads to turn everywhere you go. Really, what’s the point of accepting a dare without taking a little risk? And, if, say, a pair of trousers that you do like is selected but you've only worn them once or twice, be bold and try them out again. You shouldn’t go outside in anything that makes you uncomfortable. But, as with all things in life, there’s room here for trial and error. You can always decide to donate later. In Linda Grant’s book The Thoughtful Dresser (this writer considers it a must-read), she writes: “Clothes as text, clothes as narration, clothes as a story. Clothes as the story of our lives. And if you were to gather together all the clothes you have ever owned in all your life, each baby shoe and winter coat and wedding dress, you would have your autobiography.” This is a pretty wise mentality about how your wardrobe weaves together so many life experiences. In a sense, that heap of clothes in the corner of your room is a sort of diary, and each piece falls into a different chapter. Yes, holding on to our clothing is a way to preserve memories. And, perhaps that’s the reason why we get so attached. But, giving them away is part of the story, too. Leaving a certain trend, style, or silhouette behind because you’ve changed is okay. After all, the best part of sartorial truth or dare is what happens when the game is over. Slowly but surely, you’ll be able to fill your empty space with new designs. When you wear them, you’ll feel inspired. And, with every step you take once you walk out the door, you’ll be writing a little more.